Teo graduated from MPA in 2011 after attending for five years. Teo’s father is German and mother is Chilean. He grew up in Germany before coming to MPA but has been living in Chile for the past six years. While in Chile he studied International Business and Logistics. He did an internship with a Germany Company DB Schenker in Chile after graduating and then started working there full time. He was in India earlier this year to attend a meeting of representatives from 51 countries who are interested in bringing Kabaddi to the Olympic Games. He now has the daunting task of getting kabaddi teams and competitions set up in Chile. Where did you get your interest in International Business? I always liked business. When I was a student here, I always bought karas or other stuff in India and I would sell it when I was back in Germany or Chile. Being a student here I took business classes but I feel very lucky to have got involved in logistics. I like life with the ships and all the problems. I really like the problem solving. Every day I have plan A that would be perfect, but as you know, it never happens so you have to have plan B, and C, many different options. How do you think your time in MPA helped shaped who you are now and what you’re doing? I think what helped was a lot of people in the normal world will concentrate first on money or business, becoming a doctor, or having a family. And then, after they age, they want to learn more about yoga or other spiritual practices. I think it was good for me to have this first. When I was in Germany (before coming to MPA) I was looking for some spiritual path and then I got into kundalini yoga, and I think it helped me to practice my different point of view. To be a good problem solver you need to be calm. In some situations in my work, there is a lot of money involved and it’s important to be calm and see the best option and what we can do. But to be honest, I’ve been doing yoga since I was nine years old so it’s difficult for me to know how I would be if I didn’t have that. I think I would be a completely different person; it’s a big part of my life. Did you started practicing yoga when you were nine out of your own accord or was your mom a teacher? Our neighbor used to teach Sat Nam Rasayan in Europe he invited my mom and I to a course. I was about eight years old at the time and I remember that I really liked the feeling. After that, my mom got more into yoga, and then the yoga festival in France. We started going every year and I made friends with Amrita, Satya and others. They always talked about MPA and I wanted to go since I was 9 or 10. My mom always said no but when I was 14 she said that we could go and see how it actually is. We came to visit and my mom said that I could go for one year. I ended up going for five years. Do you still have a meditation practice now or yoga practice? When I left MPA, I used to teach a lot but in the last two years, it’s been less. I still meditate but not as much as when I was here. After India I got really into Sat Nam Rasayan. I started when I was in India. We had a class twice a week but it was always for an hour and not for more. But it helped me a lot. 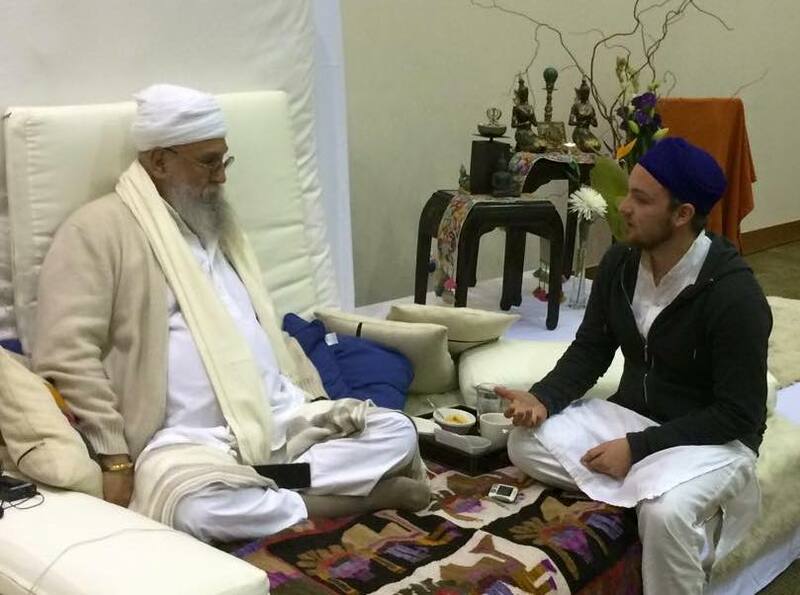 When I got back to Germany, I really got more into it, doing a lot of meditation and meditation courses. What’s it like being back in India for the first time since you graduated? It feels the same, like the vibes and everything but I don’t know as many people, mostly just the staff. But I feel I can really relate. That used to be me, right? (as he’s watching soccer). It’s nice. It’s changed a little, but not much. Some details, of course, but it’s pretty much the same. Last night we went to do seva at the Golden Temple and stayed there for a few hours. It feels like home.